Lefkada is characterized by its verdant forests and fertile valleys that reach its coasts. 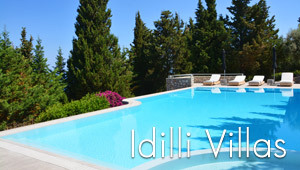 It belongs to the famous Ionian complex and lies close to the Albanian coasts. The whole island is extremely blessed with impressive landscapes, endless golden sandy beaches with crystalline waters, traditional villages and several busy tourist resorts that suggest a plethora of summer activities. Lefkada deep religious roots are shown in the number of Orthodox churches, archaeological sites and museums. The beautifully well-preserved town of Lefkada combines a plethora of traditional features and world-famous facilities which attract hundreds of tourists in the summer. A trip to the surrounding settlements of Lefkada is a chance to experience the warm hospitality and cheerful mood of the locals. The island is ideal for all tastes and ages. This section proposes a map of Lefkada with all the major locations of the island. View where is Lefkada on a map of Greece. View the map of Lefkada with Google map and discover the villages, the beaches but also all major sightseeing like ancient sites, museums, churches.